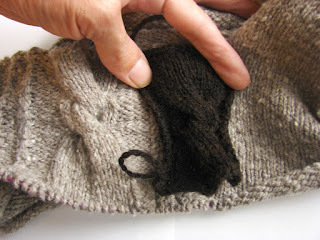 In the last post I'd decided to make some hiking socks from some black zwartbles yarn that I was very proud of. I kept looking at the skein and swatch and wasn't sure that it was saying socks to me. 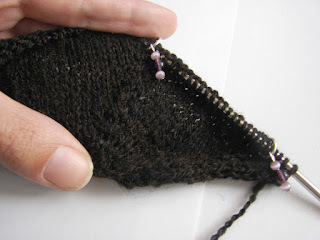 So I tried knitting a sample bit of cable from the Opulent Raglan and loved the result! The cable is very well defined with the black yarn. The grey really is a woollen yarn which is ok for the big cable but the little ones look very, well, woolly. The WIP above came to a bit of a halt after a few mistakes and some uncertainty about the yarn. Been thinking about pulling it out. I think the black is going to work far better. y'know the funny thing is that I don't really mind. probably partly because I wasn't happy with it, partly because I'm all fired up about the new version but partly because I think I enjoy the knitting more than finishing an item.